This paper reviews progress in research on taxonomy and systematics of larval marine and estuarine fishes in the Indo-Pacific since the first Indo-Pacific Fish Conference in 1981. In 1981, the literature on development of fish larvae in the vast Indo-Pacific region was sparse, scattered and of very uneven quality. 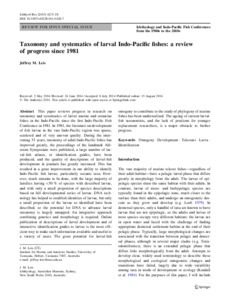 During the intervening 33 years, taxonomy of adult Indo-Pacific fishes has improved greatly, the proceedings of the landmark Ahlstrom Symposium were published, a large number of larval- fish atlases, or identification guides, have been produced, and the quality of descriptions of larval-fish development in journals has greatly increased. This has resulted in a great improvement in our ability to identify Indo-Pacific fish larvae, particularly oceanic taxa. However, much remains to be done, with the large majority of families having <50 % of species with described larvae, and with only a small proportion of species descriptions based on full developmental series of larvae. DNA technology has helped to establish identities of larvae, but only a small proportion of the larvae so identified have been described, so the potential for DNA to advance larval taxonomy is largely untapped. An integrative approach combining genetics and morphology is required. Online publication of descriptions of larval development and of interactive identification guides to larvae is the most efficient way to make such information available and useful to a variety of users. The great potential for larval-fish ontogeny to contribute to the study of phylogeny of marine fishes has been underrealized. The ageing of current larvalfish taxonomists, and the lack of positions for younger replacement researchers, is a major obstacle to further progress.